One of the biggest success stories in Tamil cinema, ‘Makkal Selvan’ Vijay Sethupathi has gone on to become a highly respected talent and a versatile artist, who has carved a niche for himself over the years with varied roles and spectacular performances. With a handful of projects namely Super Deluxe, Kadaisi Vivasayi, Maamanithan, Idam Porul Yaeval, a film with Sethupathi director Arunkumar, Marconi Mathayi in Malayalam alongside Jayaram and the Telugu biggie, Sye Raa Narasimha Reddy lined up next, fans of Vijay Sethupathi have quite a lot to look forward in the year ahead. 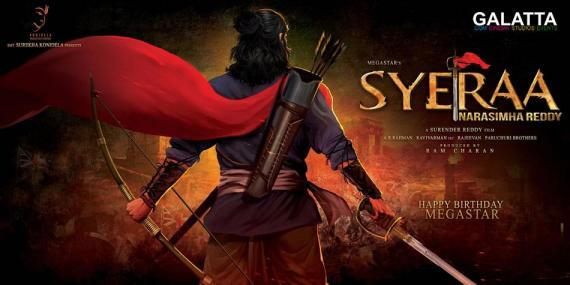 That said, his Telugu magnum opus, Sye Raa Narasimha Reddy, starring elite names like ‘Mega Star’ Chiranjeevi, Bollywood superstar Amitabh Bachchan, ‘Makkal Selvan’ Vijay Sethupathi, Tamannaah, Jagapati Babu, Kannada star Sudeep among others under Surender Reddy’s direction has massive expectations surrounding it with plans for an April 14, 2019 release. Now, the first look of Vijay Sethupathi’s character, Raja Paandi, has been unveiled in the form of a poster as well as a motion teaser and can be viewed below with music by Amit Trivedi. This will no doubt come as a big delight for Vijay Sethupathi’s fans, who have been waiting to witness his first look officially get released for a while now. >>This historical biggie faces controversy at the shooting! >>Vijay Sethupathi's period film release plans! >>Prabhas's Saaho Gets New Competition ?